3. 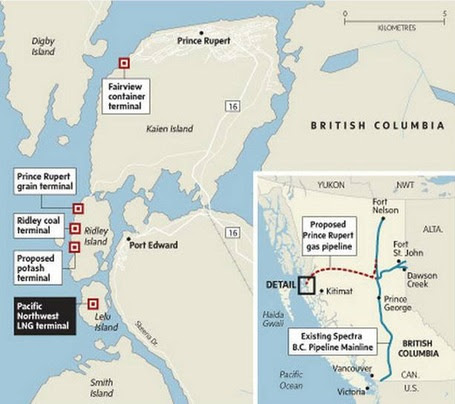 The Malaysian national oil company Petronas is widely expected to give a positive FID–Final Investment Decision–to build North America’s first greenfield LNG export terminal at Prince Rupert. 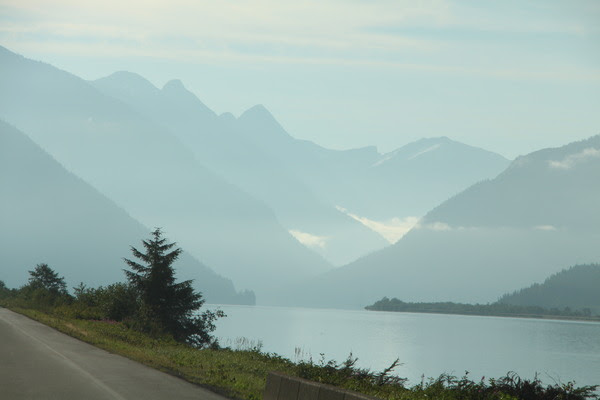 I spent three days in Prince Rupert in mid-August to get a first hand look at the leading sites, and I also drove two hours along the Skeena River over to Kitimat, the other potential hub, to check out a couple potential sites there as well. What could this mean for the economy? Consider that it costs roughly $7.5 billion to build 1 bcf/d of export capacity for aland based terminal. That huge cost is why there is increasing talk of using smaller, Floating LNG ships that would be built in Asia and towed over to Canada’s west coast. 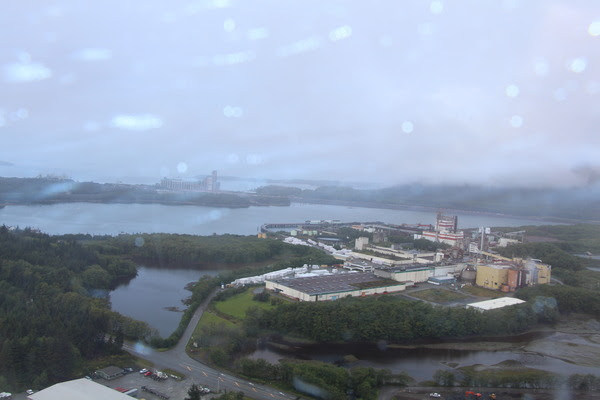 Kitimat is where Rio Tinto, formerly Alcan, has its big aluminum smelter. Built in 1954 in a way that could never happen today—two tunnels through a mountain, moving streams, etc—the entire complex is just completing a huge multi-billion dollar refurbishment, and has kept that local economy strong. The local council in Rupert is also heavily weighted to the political left, with the online resumes of councilors saying how they want to be the guardians for the environment against industry. Yet surprisingly, nobody sees development or LNG as a critical issue for the municipal elections coming this November. 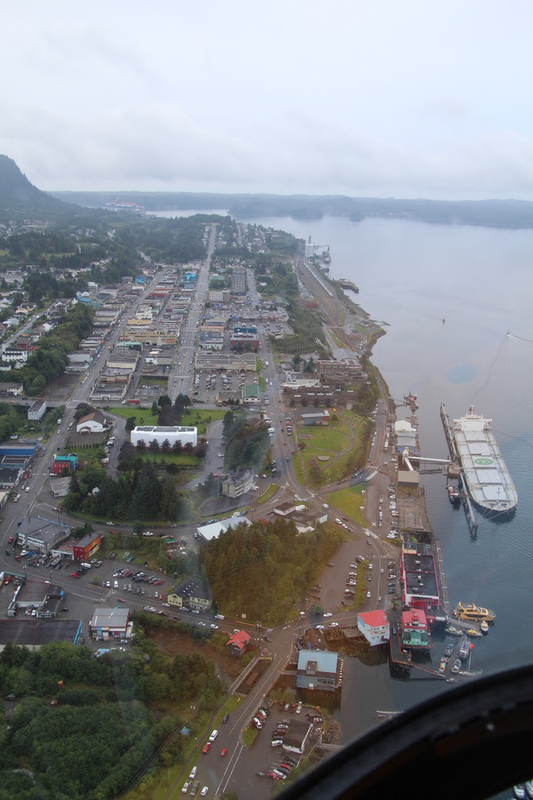 The City of Prince Rupert has become active in the LNG game, trying to re-purpose Watson Island, where an old pulp mill sits, into an LNG site. I’m not 100% clear yet why the proposed pipelines are coming through what the inlet near Grassy Point, which the locals call the Portland Canal. It must be a lot cheaper to run these pipelines in the water. The helicopter only took 10 minutes to fly back over the centre of Prince Rupert—which, when it’s not raining or fogged in, is snuggled beautifully up against the mountain on Kaien Island. It was a cloudy day, and the pilot dodged the clouds as moved a couple miles south to where Petronas and BG are planning to have their sites. 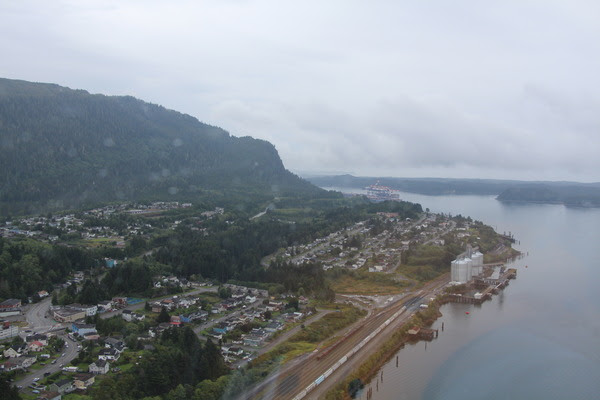 This is Prince Rupert on the north (front) side of Kaien Island. Flying just around the corner of that hill you would see Ridley Island. 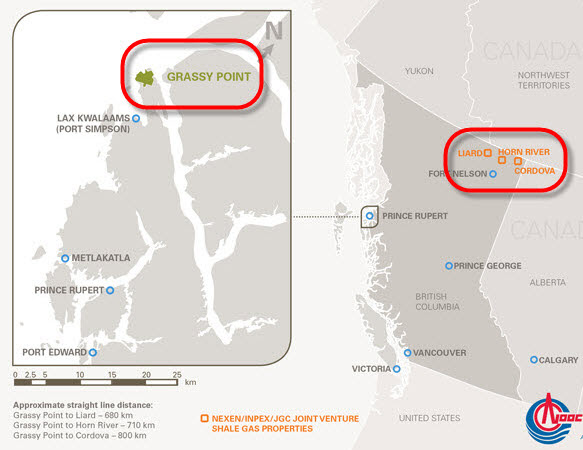 BG Group has, IMHO, the best site: Ridley Island, whose northern edge is just over a mile south of town. It’s a flat piece of land—I don’t think it’s actually even an island anymore as it has been developed so much–a big coal terminal is already there. It already has zoning. It has the waterfront that’s deep for an LNG carrier. It’s just out of sight from the town itself. Watson Island in foreground with old pulp mill; Ridley Island in background where grain elevators are. I’m looking west and the land at the top of the photo is the south (back) side of Kaien Island; Prince Rupert is on the other side. Port Edward has a separate town council–more pro-development–and Petronas has already given the town millions of dollars to begin improving infrastructure. Council has visited a Petronas LNG facility in Malaysia, with the noise issue being one of the top items to investigate—but it ended up being much quieter than the old pulp mill that shut down 20 years ago. Late this fall will be a very exciting time for this area. I believe an incredible amount of prosperity is about to hit this region. It’s building already. 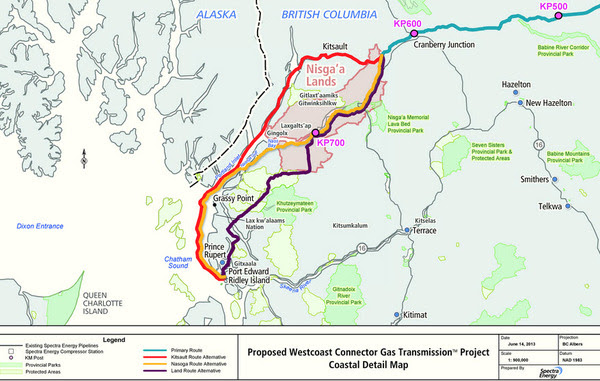 The next Big Stage with LNG will start this fall with the provincial government’s new tax regime.Then the EA for Petronas gets approved–or not. Then the FID from Petronas.